Der FCM 50 t ist ein französicher premium schwerer Panzer der Stufe 8. Die Entwicklung wurde im Dezember 1945 begonnen. Das Fahrzeug war als Alternative für den AMX 50t gedacht und vereinte typische Merkmale der französischen Vorkriegs-Panzerkonstruktionen mit deutschen Innovationen. Das Fahrzeug sollte mit einem zusätzlichen Anhänger, Ausrüstung für Unterwasserfahrt und einem abnehmbaren Minenräumer ausgestattet werden. 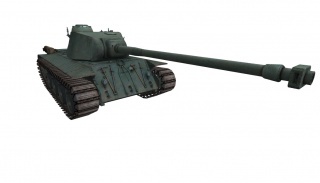 The FCM 50t is the French tier 8 premium heavy tank. It boasts preferential matchmaking that only sees up to tier 9 battles coupled with the highest-penetrating gun of its preferential premium competitors and excellent mobility that challenges even the Type 59. The FCM holds true to the tradition of French heavy tanks with its medium tank-like mobility, a large silhouette, and armor that leaves much to be desired. Thankfully, its high-traverse speed turret is mounted at the front of the hull which is invaluable for managing the tank's great length. For all intents and purposes, the FCM 50 t is a medium tank labeled as a heavy tank, with all the pros and cons that come with it. 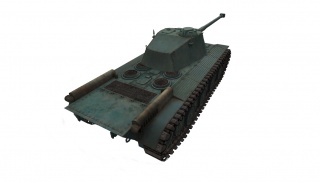 With average armor, a 90mm gun, high top speed and quick acceleration. Its best to play this tank as you would a medium tank using cover, flanking tactics and aiming for weak spots to disable the enemy to allow you to gain the upper hand and run circles around your target. The FCM 50 t is a mobile sniper that is quickly able to relocate and a become a viable support tank. It unfortunately cannot wolfpack well with other mediums due to its massive size, especially from the sides, and disturbing lack of camouflage. One should equip Coated Optics in order to spot targets as far away as possible and stay out of enemy view ranges while using the gun's penetration, rate of fire, and accuracy to slowly cut down enemy HP. You can not go anywhere near the frontlines with this tank due to its large size, lack of camo, and lack of armor, not to mention a gun that doesn't offer much at close range. You should stay at a vantage point around 350-400 meters from the enemy and give support to your allies by spotting targets from a safe distance. The gun equipped on the tank is the same gun as the top tier gun of the ARL 44. The main differences include higher ammo capacity, higher rate of fire, better accuracy, faster aim time, and overall better gun handling. It also has better gun elevation but worse gun depression than the ARL 44. It can be difficult to take advantage of the high rate of fire of this tank due to its weak armor, (unloading shells keeps it exposed for a period of time) but it is possible to get into a position with good cover where you can poke out at an enemy, fire at him before he can aim, due to the excellent gun handling, and pull back to reload. As a bonus, the gun's rate of fire is often fast enough to take an opening shot at a high tier, slow-to-reload target and follow it up with a second shot before the enemy can reload a second time, although trading your health in this way is often not a good idea, especially in early game, as you do not have much health, and you do not have the armor to bounce incoming fire. The FCM 50 t is an excellent crew trainer for the other French heavy tanks, and the credit income won't disappoint. However, since it lacks an autoloader, it plays very differently from tier 8 and above French heavies. There are two mandatory equipment choices for this tank. They are the Tank Gun Rammer to reduce reload time and the Vertical Stabilizer to drastically improve gun performance, allowing the already quite accurate gun to shoot on the move. The third equipment choice is preferential; a Gun Laying Drive will reduce aim time when stopped and help snipe more quickly, Coated Optics increases view range by 10% (which brings you close to the 445 meter maximum), and Vents to help all stats - with the additional benefit of making Brothers in Arms perk even more effective. Also, due to the giant tracks, getting a Toolbox might be recommended, as you can use your tracks to soak damage, and continually repair them. The choice is yours, however, it should be noted that having a crew with the repair skill is good enough to not have to run a Toolbox, freeing up an equipment slot which can be used for other less redundant things. Development started in December 1945. The vehicle was conceived as replacement for the AMX 50t and combined features typical of the pre-war French tank-construction industry as well as German innovations. The vehicle was to be equipped with an additional container trailer, equipment for underwater driving, and a demountable mine clearer. FCM 50t did not won the production contract for the next French heavy tank. 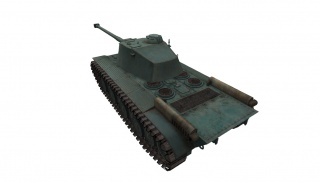 Since the winning tank, ARL-44 was based on existing designs and components, including Char B1 bis suspension, it is reasonable to assume that the FCM 50t was a conceptually update of the FCM F1. The engines were to be repositioned to the rear of the hull and a single large turret replaced the twin turret concept. 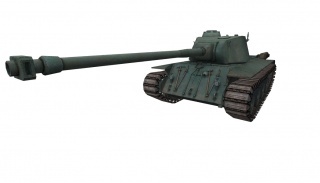 The turret was similar to the Tiger II inspired turret on the initial AMX 50 concept. Schneider canon de 90mm SA was to be main armament of the tank. One of the biggest differences between the FMC 50t and competing designs is a noticably longer rear engine deck. The long deck is explained by the use of two v12 engines combined with a complicated electric transmission. Staying with twin 550hp Renault V12s would have given FCM equivalent output to its competitors Maybach diesel without licencing foreign design solutions. In addition to the additional container trailer, the tank was to be equipped some very advanced features for its time like equipment for underwater driving and a demountable mine clearer. After ARL-44 won the French army contract all further development was stopped. No prototype was ever built. 1945 FCM 50t at chars-francais.net Photos, specs, and brief history in French.